When people ask me how I reversed Multiple Sclerosis, I tell them . . .
“I did three things – changed my diet, got off the treadmill of running myself ragged, and started my day with a “quiet time” of meditation and prayer.” Today, 32 years later, these remain my core wellness pillars – and I remain symptom free, and living the life I was meant to live. Since that time, new science has emerged that proves diet heals or harms, that stress underlies all illness, and that daily quiet time spent in spiritual practices not only boosts your immune system, but brings hope, peace, love and joy back to a tired, unhealthy body and withering spirit, a condition many people are suffering from today. The University of Maryland Medical Center has compiled studies that indicate spiritual practices can improve one’s immune function, the major system affected by autoimmune diseases, cancer, and other serious diseases. One study showed that spiritual practices encourage feelings of hope and optimism, promote healthy behavior, decrease feelings of depression and anxiety, improve coping skills and social support, and promote relaxation. In other words, a significant number of studies are now proving that your connection to your spiritual self benefits your immune system and overall well-being. The purpose of daily spiritual practices is to foster your sense of the sacred, cultivate spiritual development, and nurture your personal relationship with the Divine. Daily spiritual practices include activities such as prayer, meditation, and reading spiritual literature. A daily spiritual practice is something you prioritize and commit to practice every day. Most people who carry out daily spiritual habits report that it prepares them to greet the day with peace and equanimity, restores a sense of balance, centers their thoughts, and strengthens them to meet the day’s challenges and opportunities. Through these peaceful, yet powerful habits, you can develop your highest self – the part of you that is naturally loving, trusting, innocent, compassionate, kind, caring, and joyful. By doing daily spiritual practices you will also cultivate the part of you that is creative, as creativity is closely related to your spirituality. Typically, daily life does not nurture these qualities in us. Due to the daily barrage of media (geared toward our lowest qualities), our culture’s obsession with materialism and competition, and our personal interactions with people who challenge us to be kind and loving, it is important to spend time each day remembering who we really are and why we’re here. Spiritual energy renews us. It reminds us of our goodness, helps us to see the goodness in others, and helps us to treat ourselves and others better. These daily moments of peace and divine inspiration give us a sense of direction not only for the day, but also for our life. 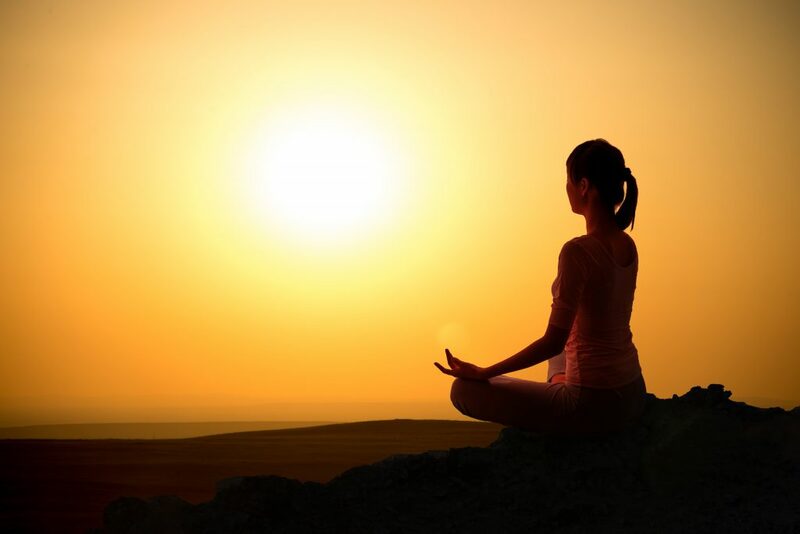 Spiritual development is commonly described as “walking a path.” By putting spiritual exercises into practice, we feel that we are moving along a path toward a goal, and that goal is our spiritual transcendence – a way to our highest self, and ultimately union with God, where we truly feel one with the Divine and all of life. These daily moments also help us to reach a state of bliss – or a feeling of total peace, love, and joy. In all the major spiritual traditions, words such as Samadhi (Buddhist), Satori (Japanese), Nirvana (Hindu), or Enlightenment (Christian) denote complete understanding of the nature of all things, and a feeling of bliss. 1. Choose a place: Look around your home and find a spot that feels peaceful and/or “sacred”. You can also transform an existing space by clearing out things or adding items that are meaningful and bring you joy. 2. Set a time: Any time works, but it is important to commit to a specific time each day that you will not allow anything to interfere with your spiritual practice. Mornings are excellent to start your day off on the right path, and help it to go more smoothly. 3. Stick to it: Commit, honor your commitment, and don’t quit. 4. Grow: Become the person you want to be. If your faith in yourself and the Divine does not yet feel unshakable, don’t worry. Remember the proverb in the Bible – “even if your faith is “as small as a mustard seed,” it has the power to move mountains.” I have seen this phenomenon over and over with my clients. Once they take even the smallest step toward self-nurture and reconnect with their spiritual selves, opportunities open up, and wonderful “arrangements” for more joy and success are made for them. This is one of the things that make my work so fulfilling and joyful. I hope you will give this a try if you aren’t already enjoying the rich benefits of spending time connecting with your spirituality. Give it a try and let me know how it goes for you. Leave a comment below or go to my Facebook page and leave a comment (and inspire others). P.S. This article was excerpted from my book, Rebuild Your Immune System in 10 Minutes a Day. If you haven’t gotten a copy yet, you can order it here. 139 Steven D. Ehrlich, “Spirituality,” University of Maryland Medical Cente, last updated on September 24, 2013. 140 J. David Creswell et al., “Mindfulness-Based Stress Reduction Training Reduces Loneliness and Pro-Inflammatory Gene Expression in Older Adults: A Small Randomized Controlled Trial,” Brain, Behavior, and Immunity 26:7 (2012): 1095–1101, doi:10.1016/j.bbi.2012.07.006.